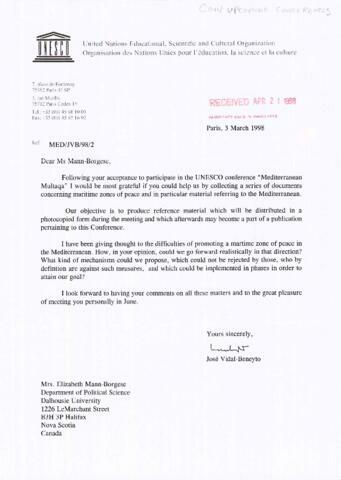 File contains material, including correspondence, reports, agenda, and registrations forms for the United Nations Educational, Scientific and Cultural Organization (UNESCO)'s 1998 conference called "Mediterranean Multaqa," which was chaired by Elisabeth Mann Borgese. The conference aimed to explore the idea of establishing the Mediterranean as a maritime "zone of peace." Also included in this file is a concept paper, "Integrating Sustainable Development and Regional Security," and a statement by the chair of the closing session, both by Mann Borgese.